The TerraExt Sedum Standard is a traditional, pre-grown system that uses a low maintenance sedum planting rolled on top of 10 cm of a proprietary blend of extensive engineered growing medium. Plants are grown on a “blanket” and harvested like sod. Provides excellent instant green with 85% foliar coverage upon installation. Helps reduce water evaporation, soil erosion and weed growth. The growing medium is contained by a filter fabric laid above the rest of the system’s under layers. Most components come in rolls that are easy to transport and install. 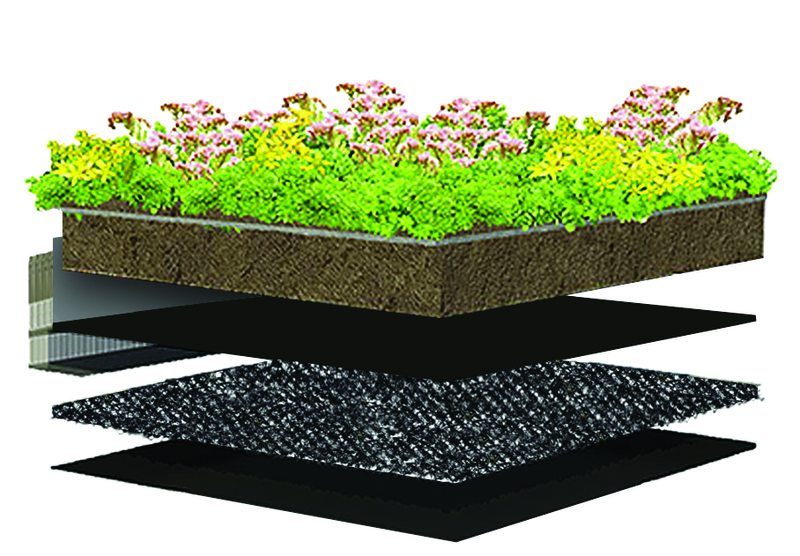 Next Level Stormwater Management’s BioBerm™ offers a seamless integration of extensive and intensive green roof features: pre-grown sedum groundcover and a custom planting option. Varying depths of engineered growing medium create topographic variation and increased biodiversity. 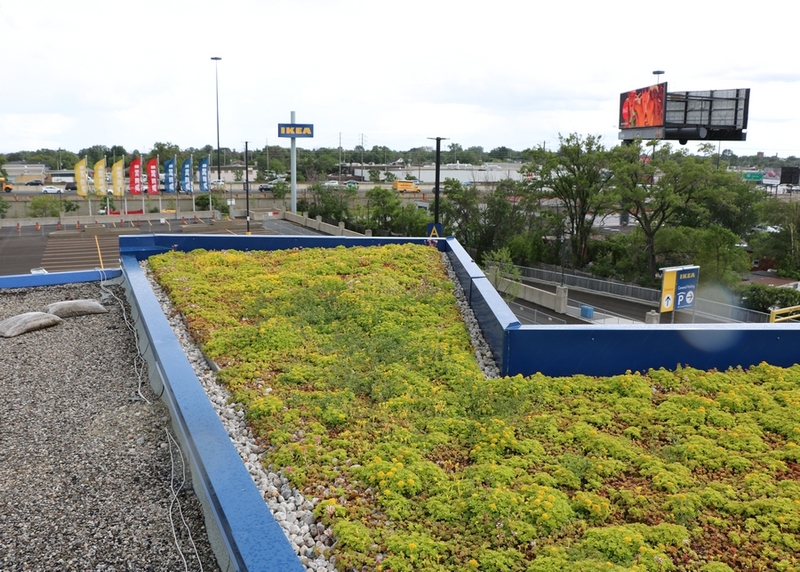 Flexible sedum mat drapes over the undulating roofscape helping reduce water evaporation, soil erosion and weed growth. Innovative for providing an enhanced aesthetic in a custom manner, over areas that are highly visible or that do not have strict weight restriction. 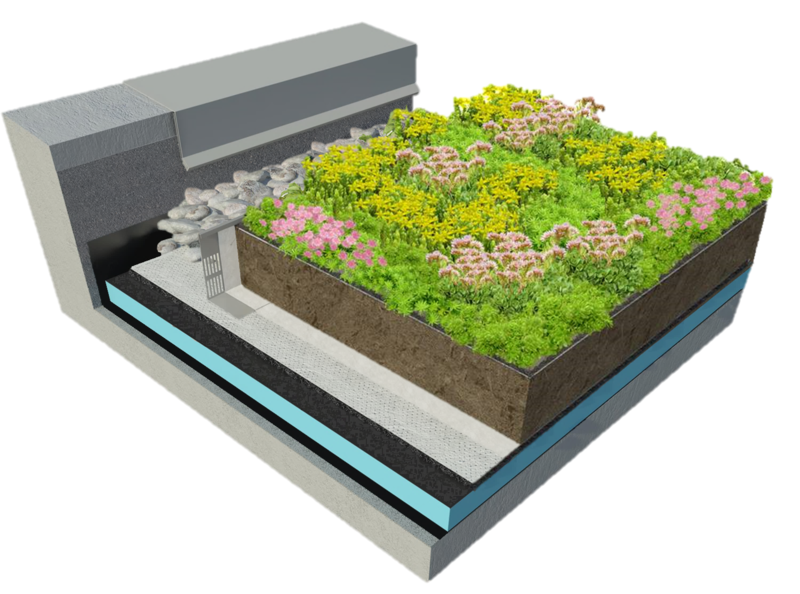 Next Level Stormwater Management’s systems easily adapt and conform to various roofs. The sedum blanket and premium base layers are fully customizable and can be easily cut to fit any shape and design. Next Level Stormwater Management provides a Survivability Report with details about the success of our projects to assist with permit processes, such as the City of Toronto permit application. For more info, or help with other municipalities, please contact us.